Mild low lather formulation. 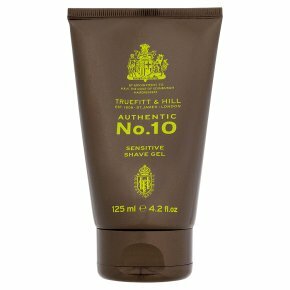 Moisturises for a more gentle shave. Paraben, alcohol, sulphate free. Professional Barber approved. Dermatologically tested for sensitive skin.Benefits: The Sensitive Shaving Gel is enriched with Willow Bark, Borage Oil and Aloe Vera to provide best results whilst caring for the skin. Directions: Squeeze a small amount of the Gel into palms of your hands. Apply to cleansed, damp skin. Shave and rinse skin with cold water. Barbers Tips: To help avoid irritated skin, never shave against the grain of the bristle. Rinse blade every time after use. WARNINGS: Avoid contact with eyes. In case of contact, rinse immediately with clean warm water.